Nurses are required to possess a wide range of technical skills, work within an emotionally testing environment, perform complex clinical procedures, while the whole time maintaining a professional demeanor. So how can your ability to do all this be successfully crammed into a one-page resume? The first thing to note is this: you aren’t trying to list your ENTIRE CAREER on your nursing resume. Your job may pull you in all directions and demand a lot, but by trying to include this on your resume you’ll just end up with a messy resume that no hiring manager will want to read. key to writing a good nursing resume is highlighting the range in your clinical skills, identifying what makes you good at your job, and demonstrating what you’ve accomplished. The key to writing a good nursing resume is to highlight the range in your clinical skills, identify what makes you good at your job, and demonstrate what you’ve accomplished. To help you decide what to put on your nursing resume, you should be objective and assess where your strengths lie as a nurse. Try to get into the mind of your boss – what would he/she say your best qualities are? Think about what goals you are set each week/month. Are there any tangible measures of your success as a nurse? Did you receive any particularly positive performance reviews? Any success your ward, unit, department, facility or hospital/medical facility was commended for can be considered your own accomplishment and included in your nursing resume. TIP: Don’t clutter your resume with too many day-to-day duties. Instead, highlight a number of more complex duties that illustrate the range in your clinical skills, while remaining achievement focused. Soft skills are intangible and hard to substantiate, compared to technical skills. You can’t measure someone’s level of compassion, however you can check whether someone knows how to intubate. Therefore, you should avoid including too many soft skills on your resume, since anyone can claim to be “hard working, patient focused, compassionate, etc.”. Don’t leave them out all together, just make sure they are subtly weaved into the fabric of your resume. Technical skills impress hiring managers, and should be the primary focus of your nursing resume. Nursing is all about experience and ability – your technical skills, along with your previous nursing experience forms the backbone of your resume. This is why you should avoid including too many day-to-day duties. You will fail to demonstrate the range in your technical skill set by writing that you know how to dress wounds and measure blood pressure. 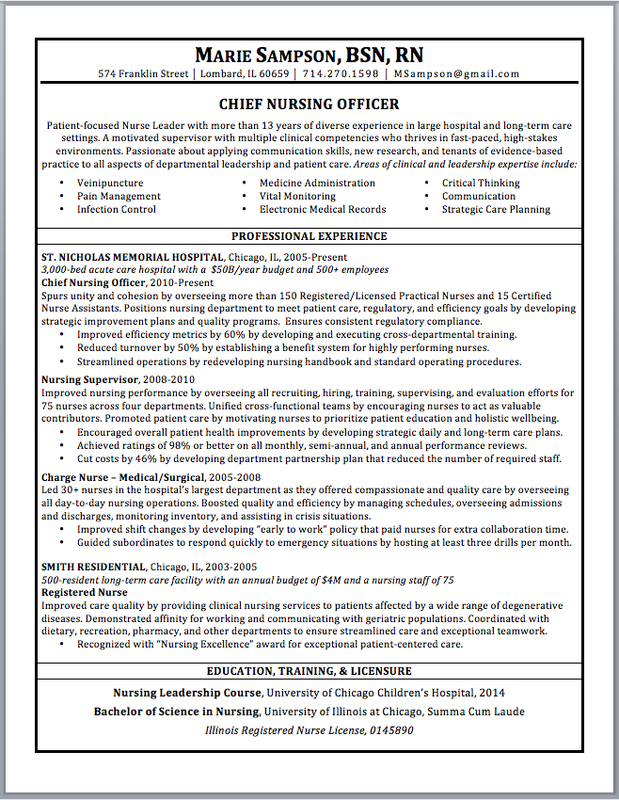 Below is a nursing resume example for a Chief Nursing Officer, who’s also a Registered Nurse and has a Bachelors of Science in Nursing (BSN). We’ve included an explanation of some key elements that make this a great resume, and explain how you can use this nursing resume sample to help you write your own resume. One of the key qualities of this nursing resume is the fact that it’s only one page long. Although the resume documents 13 years of professional experience within nursing field, from 4 different career levels (from RN up to Chief Nurse Officer), the writer has managed to keep the document brief, concise, and easy to read. Using a professional title at the top of your resume, i.e. Chief Nursing Officer, helps you identify yourself as a professional and a specialist in your field of nursing. Consider your specialty and do the same if you’re writing your own resume; check the title of the job you’re applying for and consider using this as your professional title. Include your particular field (e.g. cardiology, orthopedics, obstetrics, ambulatory, Registered Nurse, Licensed Partitioning Nurse, Emergency Trauma Nurse, Home Healthcare Nurse, etc.). Any decent nursing resume needs a clear presentation of key skills. If you look at this nursing resume example you’ll see the professional resume writer has successfully chosen nine specific key skills and stuck them right at the top of the resume, in the all-important first one-third of the document. These cannot be ignored by the reader, and more importantly, they will actively engage that person. If you’re writing your own nursing resume, be strategic about which skills you list here; review the specifics of the job you’re applying for and ensure they correspond to job requirements. With many different types of software becoming more and more involved in the modern job search and recruitment process, it’s paramount you keyword optimize your resume. Using a key skills section to pack these keywords into your resume is a simple but effect technique that will help your resume pass applicant tracking software, and make you more searchable as a candidate. As explained earlier in this article, the best nursing resumes don’t include endless lists of job duties and responsibilities – there’s no need to. What’s important is that you convince the reader you’re worth granting an interview by demonstrating your past success. Within the above sample resume, the writer has only included 3 short bullet points, all focused on specific achievements that are presented using easy-to-read numerical data. Don’t Forget The Important Stuff! You’d be surprised what some people leave off their resume. I’ve reviewed resumes where contact sections were missing phone numbers, email addresses, one even lacked a name! Be sure to include the important stuff, like if you’re an RN you should include this along with your license number. Here’s an awesome infographic that summarizes some great advice, ready for you to enjoy. This data incorporated into this visual delight is taken from a number of authoritative sources, all put together by Carrington College who specialize in medical education. Don’t forget, if you have anything you want to say about the content of this page, or you have questions for our experts, comment below and we’ll be sure to respond! The one way to ensure your resume earns you interviews is to use a professional resume writing service. Professional resume services match you with an experienced writer, specialized for your industry who will can create a custom written resume. Order now and use the discount code: blogreader to get a 10% discount on your resume writing service! Call 1866-706-0973 to speak to a resume consultant toll free, or visit our resume writing plans and pricing here.